Refinishing outdated bedroom furniture may seem like a difficult task at first, but when broken down into simple, easy to follow steps, it becomes much easier. While some knowledge of sanding and staining is recommended--you may want to practice on scrap wood or salvage furniture or seek experienced help before working on expensive items--with a bit of practice and dedication you can refinish your own bedroom furniture, saving yourself a lot of money in the process. Move the piece of bedroom furniture that you plan to refinish to a well-ventilated work area. Cover the ground of the work surface with disposable plastic sheeting to avoid damaging the area. Cover any other pieces of furniture or items that may get damaged during the refinishing process with plastic sheeting as well, using painter's tape to hold it in place. Put on rubber gloves and clear goggle to protect your eyes. Use a gel-type chemical stripper to remove the finish from the piece of furniture. Apply the stripper in a small, manageable area with a 2-inch chip-brush. Let the chemical stripper sit on the area for the amount of time recommended by the manufacturer without touching. After the recommended time, test to see if the finish is ready to be removed by running a putty knife with rounded edges on the wood, always going with the grain. If the putty knife goes through to the wood, you are ready to remove the stain from the entire area where you applied the chemical stripper. Apply the chemical stripper on other areas of the furniture, working in small, manageable areas. Let the stripper sit for the recommended time and test with a putty knife, always scraping with the grain. Repeat the stripping process in any areas that require additional attempts. Some furniture, especially older furniture, will have stubborn spots and may require more work to strip the original finish. Rub the entire surface area of the piece of furniture lightly with medium-grade steel wool once you have removed as much of the stain as possible with the putty knife. Using the steel wool will help to make sure all of the original finish is removed. Sand the piece of furniture with 120-grit sandpaper to remove any remaining finish and to smooth out the surface of the wood before refinishing. Repeat the sanding process with 220-grit sandpaper to finish. You can use a finish sander to do the sanding if you have one available and you can use it properly. Apply paste grain filler to the sanded piece if it is made of an open grain wood like mahogany or oak. Apply the grain filler with a clean rag, and let it set according to package instructions. Remove the excess grain filler with your round-edged putty knife, being careful not to gouge the wood. If you are working with closed grain furniture, you can skip this step. Apply sanding sealer to the dry piece of furniture to help the item absorb the stain properly. Apply the sanding sealer with a paintbrush, and allow it to dry for 10 to 15 minutes. Wipe off any excess sealer with a clean rag. Stain the chair using water-based liquid stain in the color of your choice. Pour the stain into a clean bottle, and put a little on a rag. Rub the stain onto the piece of furniture and allow it set, working in small areas, but working quickly. Wipe any excess stain off and allow it to dry. Continue applying stain to the piece of furniture for a darker finish, making sure to wipe off excess stain between each application. 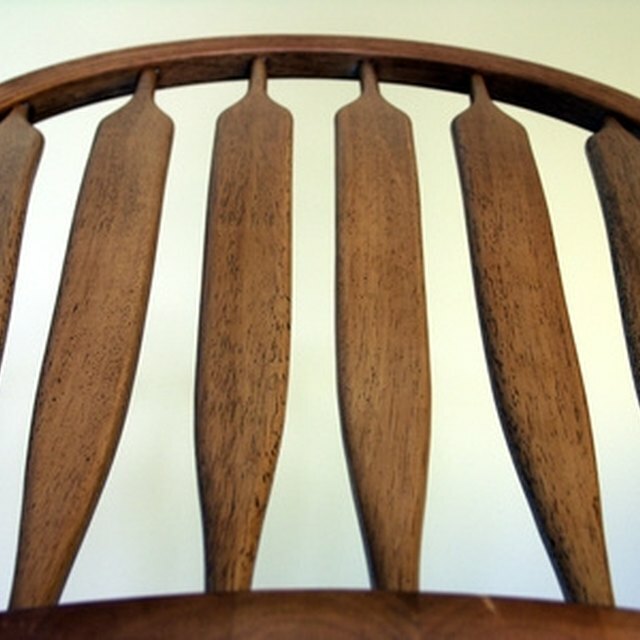 Apply a coat of polyurethane with a clean paintbrush to the chair once the stain has dried. You will need to apply several thin coats, working with the grain of the wood. Sand the piece of furniture between each coat with 220-grit sandpaper. Allow the final coat to dry and dispose of the plastic sheeting.